I’ve blogged several times about wearable pixels as well as pixels for interior design and architecture. But for the world to be a canvas for digital light, digital light must conform to the world as it is — a world of moving shapes and forms. Forms that bend, shift and stretch. Projected light does this, but it can be limited by ambient light, sight lines, the color of the surface, and projector positioning issues. Pixels from projected light are really reflected pixels. But what if the digital canvas could directly emit light, not just reflect it? That would open up a huge number of ways to use digital light. 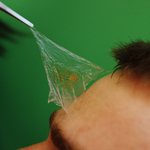 Recently I posted about work at the University of Illinois-Urbana where electronic circuits, including circuits with LEDs, could be put directly on the surface of the skin and other flexible surfaces. Now, we’ve learned about the work of Dr. Qibing Pei his team at UCLA. The picture shows a blue light emitting surface being stretched 45%. The stretching is reversible. This is a really important step forward. So far, we’ve mostly seen bendable light, but those approaches were usually brittle –and bendable isn’t the same as stretchable. The UCLA team solved this by fabricating transparent electrodes that included single-walled conductive carbon nanotubes and polymer composite electrodes in an interpenetrating network of nanotubes and polymer. This created a combined electrode with low sheet resistance, high transparency, high compliance and low surface roughness. 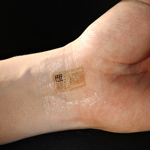 They sandwiched a light emitting plastic between two of these new electrodes, applied current, and created stretchable light. The pictures show a single stretchable light emitting surface…essentially one pixel. But this is just the beginning. Image this scaled up into large numbers of tiny, colorful, controllable, malleable pixels. It’s early days yet, but imagine this being applied to wall coverings, furniture, curtains, clothes. It all depends on how rugged, scalable –and of course inexpensive– this process will ultimately become. It’s no stretch (bad pun) to say this could be a big step forward to the pixels-everywhere future. You can read the UCLA press release here. More Wearable Pixels…. get out your sewing machines. In early July, I posted about ‘wearable pixels“. 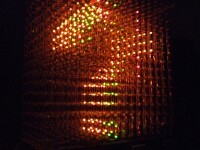 The other day, I came across several kinds of sew-able pixels on the inventables.com website. Here’s a picture of one kind; there are more in the Inventables site. 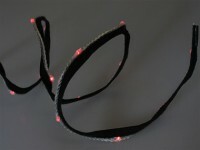 It looks like you can’t control individual LEDs, but it would be cool if you could. Get out your sewing machines. I’ve commented several times that pixels won’t be everywhere unless power consumption significantly drops. David Haynes over at the sixteen:nine blog wrote an interesting article about energy consumption improvements in electronic billboards. The good news is that the industry claims a significant improvement (in part based on using them in smarter ways); the bad news is that energy consumption is still very high.